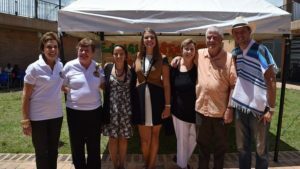 This project began because of a friendship between Maya, a young Peace Corps Volunteer and Katy, a dedicated Colombian mother. Their connection was based on a shared dream: a dream of a town in peace. A dream of a town where children would feel listened to and safe to be their authentic selves. A dream of a town where adults would value the unique talents of every child and empower them to become the leaders of the future. That dream was the basis of what would become, Talleres por la Paz. If Talleres Por la Paz was a tree, this dream would be the seed that started it all. The first phase of the project was a training on the facilitation of groups of diverse people led by Eduardo de La Vega. Eduardo taught only with experiential education, an educational theory that engages participants fully in an experience, then allows them to reflect and learn through that experience, and then apply lessons learned to future situations. Many participants came to the training expecting to find a lecturer with a group quietly and diligently taking notes; instead they found a group of professional adults laughing and jumping around an auditorium while playing a game with a huge beach ball. Throughout the training, the diverse group of 25 teachers, government workers, student teachers, and community members learned about one another. They learned that despite their vast differences in age, gender, socioeconomic level, and position in society, that they were all good people living complicated lives. They had all suffered, faced challenges, done things to be proud of, and had dreams. With this cushion of empathy developed on the first day, the group moved on to more difficult challenges. They asked tough questions and discussed the most pressing issues of Manati. Not everyone always agreed with what the other was saying, but they all listened to each other. By the third day, they were ready to develop and practice their own activities to take back to the classroom or to use in the children’s workshops. If Katy and Maya’s dream was the seed, then the first phase was the roots of the tree. The roots are the foundation of the tree, the part that digs deep and withstands any type of damage that is done to the parts above ground. Eduardo de la Vega’s training was what allowed the roots of hope, knowledge, and experience to take hold in the hearts and minds of the 25 diverse people who graduated from the first phase. No matter what happens with the project in the future, they will always have the roots. Just as a tree cannot grow without its roots, the project could not grow without the first phase. In between the first phase and the second phase, the trunk of the tree began to grow. The project directors and student teachers held a meeting which allowed the student teachers to fulfill their role as the main developers and creators of the children’s workshop. By starting with the question, how do we want to change education? the student teachers decided on goals and objectives for the children’s workshop. They wanted a more empathetic education system and so one of the main goals of the workshop was for students to leave the workshop as more empathetic, tolerant, and respectful students. As a trunk is the principle vehicle to transfer the nutrients of the roots to the branches, the student teachers are the connectors that transfer the knowledge and experience in the roots to the children, the branches of the tree. The second phase of the project was the children’s workshop. On the first day the student teachers facilitated a series of team building and relationship building activities with the participants. The kids’ favorite game was the popcorn machine, in which a team holds onto a parachute as balls “popcorn kernels” are thrown onto the parachute. The teams had to work together to make the popcorn kernels jump into the air and land back onto the parachute while more kernels were being thrown onto the parachute. On the second day, the student teachers facilitated a school wide scavenger hunt, in which teams had to use a map to find hidden puzzle pieces to complete a puzzle. During the activity, it was discovered that some teams were cheating by stealing other teams’ puzzle pieces, thus not allowing them to complete to puzzle. What was originally designed as a team building activity, was quickly turned into a valuable discussion with the kids about the repercussion of cheating in the real world. Due to the cheating, none of the teams were allowed to win and the kids experienced the disappointment of how one person’s dishonest actions can ruin the outcome for everyone. They were able to connect the cheating in the game to examples of cheating in the real world. One kid remarked, “It starts with stealing a puzzle piece and turns into a bank robbery.” After getting to know each other, by the third day they felt safe to talk about their lives with each other by creating and sharing a book of their life. The kids commented that they felt relief after sharing their stories with their peers. The student teachers were able to interact with the kids in an informal setting, allowing them to understand and empathize better with their future students. One student teacher commented that the activity helped him to understand that these kids have real problems that extend beyond a lost pencil or school assignment, and that he will be able to be a better teacher by learning about his students’ problems. The branches are the newest part of the tree, the part that is growing the fastest. The branches hold the ultimate product; the leaf, the flower or the fruit. Through the children of the workshop, all the people involved could clearly see the fruits of their labor. All of the 45 children that attended Los Talleres por la Paz developed or practiced at least one new interpersonal skill. For the student teachers, the children's workshop was an opportunity to grow as professional educators and gain experience. For the kids, the workshops were an opportunity to make friends with kids from other schools, build/encourage empathy, have fun and learn for 3 days during summer vacation. With a total of 70 direct beneficiaries and hundreds of indirect beneficiaries, there is no limit to how deep the roots can go, how sturdy the trunk will be, how many branches will grow, and how many fruits this tree will produce. The tree of Talleres por la Paz can only be watered by the strength of the relationships with the different communities that support it. The support of an association of RPCVs in the States was just as fundamental as the support of the local school community in the overall outcome of the project. Maya and Katy were only able to turn their small seed into a tree by building and strengthening communities and the project will only succeed in the future if it continues to do just that. 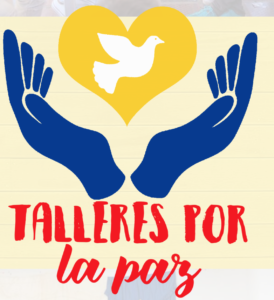 Our main goal for Talleres por la Paz was to promote significant change in the way teachers conduct school and classroom activities, so that students effectively develop interpersonal skills that will enable them to better relate to their classmates and prevent instances of bullying or exclusion in the school context. By accomplishing the following three main project objectives the project directors feel confident that the project was a success. 1. At the end of the student workshop (phase two), 8 student teachers facilitated a total of 12 age-appropriate experiential learning activities that promoted one or all of the workshop principles among participants (empathy, conflict resolution, and teamwork). 2. At the end of the student workshop, 45 children between the ages of 7-13 developed interpersonal skills related to the workshop principles. 3. By the student workshop in December 2017, 8 student teachers applied at least two new strategies to collaboratively design activities based on experiential learning that was used to promote one or more of the workshop principles. Total Beneficiaries: A total of 70 people from the ages of 7-60 and 4 organizations were direct beneficiaries of the project. The Peace Corps has a small but disturbing role in Pajaros de verano (Birds of Passage), the fourth feature film involving Ciro Guerra and Cristina Galllego, this time as co-directors. Even before its screening in Colombia in August, its success was guaranteed. It was selected to inaugurate the Director’s Fortnight at the prestigious Cannes Film Festival in May, the first Latin American film to have that honor. Its featuring of women as community leaders as well as creative cinematographers was more than timely at Cannes, where a demonstration was organized to protest the gender inequality that pervades the industry. The film was the recipient of awards in Croatia and Poland, with excellent reviews from the Hollywood Reporter and Variety, key film industry publications. It is Colombia’s selection for the 91st Academy Awards to be held early in 2019. So, Pájaros de verano will be around for a while and, according to Cristina Gallego, it is a film whose seed was germinating for more than ten years. Pájaros covers the twelve year period 1968-80—a time in which the marijuana bonanza developed, increased and declined, leaving devastating consequences for the Wayuu Indians of the Guajira, and Colombian society in general. The “bonanza marimbera” is cited as a forerunner of the Medellín and Cali drug cartels. What is new about Pájaros de verano? It tells a story of a strong Wayuu woman, Úrsula Pushaina, who headed a clan that became a protagonist in the exportation of marijuana to the United States. Úrsula’s control over her clan stems from her support and defense of her people under the most adverse conditions—and those conditions abound! Neglect by the local and central authorities as well as a hostile geography are just some of the factors contributing to the massive cultivation and export of marijuana. Having taken steps to insure the portrayal of the Wayuu community objectively and truthfully, why then, was the same standard not applied to the Peace Corps? Volunteers appear early in the film. When Raphayet, a Wayuu Indian, and his alijuna (non-Wayuu) friend, Moises, stop at a local store, some volunteers arrive and ask the store owner where they can obtain marijuana. Raphayet and Moises take note. Moises takes Raphayet to a local beach where the volunteers congregate. They observe a day of “relaxatio” induced by the sharing of marijuana. Shortly thereafter, the volunteers are seen “at work,” distributing leaflets warning against the dangers of communism. The volunteers in the film are one-dimensional caricatures. They have no names. They are all the same: young people out for a good time with minimal concerns for their work—spreading the anti-communist message. Marijuana was well-known to the indigenous population and to the Colombian alijunas in the area. What the Peace Corps provides is an expanded market for the marijuana as well as connections to the gangster element in North America willing to invest in expanded production and transportation of the marijuana from the Guajira to the United States. It is clear that the values of rampant capitalism which further production and distribution of marijuana, are not new to the Wayuu community or to their criminal counterparts. The profit motive clashes with deeply held values and wrecks havoc with the social structure, turning clan against clan and generation against generation. Prosperity is indeed brief, and the society that survives the bonanza marimbera is scarred for generations. To its credit, Pájaros de verano focuses on the changes within the Wayuu community resulting from the increase in marijuana production and export. Disillusion comes quickly, but extracting the community from the drug traffic is not a viable option. Úrsula Pushaina is a strong woman who defends her clan even though her decisions and actions were responsible for their initial involvement in the drug traffic. The same courtesy is not extended to the Peace Corps whose representatives are portrayed as full-time pot-heads with a dubious political mission. With no evidence presented, the volunteers are the instigators of more than a decade of violence and corruption tied to the bonanza marimbera in the Guajira. History tells us that this period in the Guajira was fraught with violence. It has never presented a case for the Peace Corps’ involvement. The conclusions about the Peace Corps are based upon innuendo and association rather than fact. Ironically, Úrsula Pushaina, who knowingly led her clan into the marijuana trade, is a tragic heroine, while the volunteers are shown as the bad guys and gals who placed temptation in the path of the innocent natives. Pájaros de verano is scheduled to open in the United States in February, 2019. Behind the camera documentaries and extensive interviews with both Ciro Guerra and Cristina Gallego are available on the Internet. In none of them was the portrayal of the Peace Corps an issue. The directors and screenwriters took the easy way out by inventing a false role for the Peace Corps in the Guajira, and in Colombia. Refuting the stereotype is a necessary task which may fall on deaf ears. Audiences for this film will undoubtedly be captivated by the excellent presentation, acting and cinematography. The erroneous treatment of the Peace Corps is a minor detail which can be tolerated. This “mistake” however, defames an organization (the Peace Corps) and its members (the volunteers) and should not be allowed to go unnoticed or unchallenged. Pájaros has many positive aspects. It is a film worth seeing. It should aim for honesty in all of its portrayals. In Fundacion, it is all about the partnerships. Yarmila Altamar, a 46 year old single mother and entrepreneur created La Olla Milagrosa in 2015 to serve an impoverished Fundacion community. 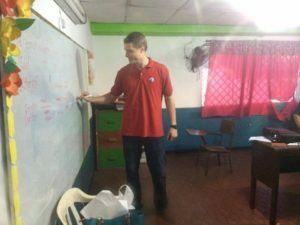 In November, 2016, when Andrew Koch, a Community and Economic Development Peace Corps Volunteer arrived on the scene, she was already looking for a way to make Olla’s services sustainable. As part of Peace Corps training, Andrew participated in an October presentation about TCP Global’s micro-loan program, which provides a funding stream for effective grassroots organizations like Olla Milagrosa. He connected Yarmila with TCP Global and an agreement was entered on April 6th. 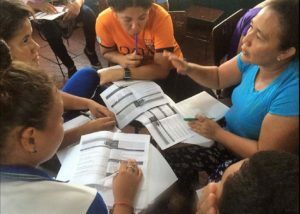 Business training was made a prerequisite for a loan in Fundacion and Andrew helped Olla develop training materials for entrepreneurial attitudes, SWOT analyses, marketing, accounting and budgeting. Andrew immediately saw another partnership opportunity with the National Agency for Vocational Training (SENA). Through his work with 11th graders enrolled in SENA’s technical accounting degree program at the high school Tercera Mixta, Andrew noted that only three students had graduated with the SENA degree in 2016 because most were unable to find a suitable 440 hour internship. Working with the students, school staff and Olla Milagrosa, Andrew helped establish internships as business advisors for twelve students, thus helping the students complete their 440 hour requirement by participating in the ten training sessions for prospective loan recipients and then helping them write and present their business plans at a May 31st graduation ceremony. The business plans consisted of mission/vision statements, histories of the business, competitive analysis, target markets, marketing strategies, administrative plans, and budgets. Andrew recognized that the nine women and one man micro-entrepreneurs were already applying a majority of these strategies in their small businesses. In many cases the training just helped them articulate what they were already doing and establish achievable goals. Thanks to TCP Global’s own strategic partnerships, Olla received $1500 in late June, which was immediately distributed as $150 loans. The NPCA Community fund partners with TCP Global as its 501c3, while Friends of Colombia and Rotary have provided significant financial support over the years The allocation to Olla was funded with $500 from a Rotary District grant and $1000 from Friends of Colombia. None of the entrepreneurs in the Olla program currently have bank accounts and all have past experience with ‘pagadiarios’ which charge up to 20% per month in interest, making it very difficult for a small business to prosper and grow. Now that they have affordable loans and continued assistance in accounting and budgeting from the students they and their businesses have a brighter future. One of the objectives of TCP Global is to help entrepreneurs such as these enter the formal economy. After establishing good credit with TCP Global loans, entrepreneurs in other sites have successfully accessed bank loans. More and larger business administration classes are in the pipeline for August with grander plans of forming new businesses in the impoverished neighborhood that Yasmila and Olla Milagrosa serve. Andrew Koch has facilitated significant change in just the first 8 months. Thanks to strong partnerships that he helped establish, Olla Mlagrosa is on the path to the sustainable development that Yasmila envisioned. Serving as an education volunteer through the Peace Corps has its challenges, along with its perks. Last week (October 10th-14th), three current Peace Corps volunteers in Colombia had the chance to experience one of these said perks. PCV’s Alexandra Reed, Michelle DiIeso, and Michael Owen were given the unique opportunity to collaborate with both the Marina Orth Foundation and RPCV’s who served in Colombia during the 1960’s on a weeklong English Immersion experience for over 100 local teachers in the city of El Carmen de Viboral. 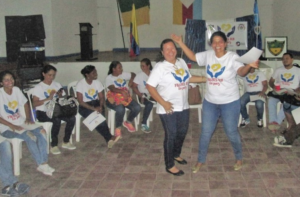 This was the first time that the Peace Corps had officially been to the interior of Colombia since the 1980’s, when the program was unfortunately disbanded due to civil distress in the country. 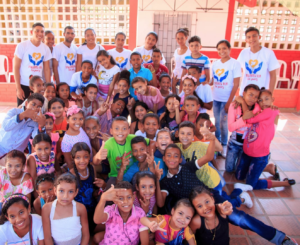 The Marina Orth Foundation, founded by RPCV Maureen Orth, who served in Colombia in the 1960’s, is dedicated to providing a model of education that is both accessible and sustainable to both primary and secondary students throughout Colombia. Through the use of technology and English language skills acquisition, the foundation strives to be an example for the rest of the country on how to make higher education an attainable goal for all the children of Colombia. During this weeklong experience, local teachers gained new ideas on how to interactively teach their students English. The current PCV’s were paired up with RPCV’s and together delivered dynamic ways to teach grammar, vocabulary, and conversation. Participants also received helpful ideas on how to incorporate technology into the learning environment in their schools. The teachers that participated finished the week equipped with new materials and a different outlook on how to encourage their students and further engage them in learning English. This once-in-a-lifetime experience helped bridge the gap between current and former volunteers, while also providing a different work environment in which the current volunteers could gain valuable knowledge to take back to their sites. To read more about Michael's time in Colombia, check out his blog: http://lavidademigi.blogspot.com/. Before I even applied to Peace Corps and graduate school, I remember hearing many people say how Peace Corps would open doors. I became a PC Masters International student back in 2011 because combining a graduate program in Teaching English to Speakers of Other Languages (TESOL) and PC service in an English teaching program seemed like an ideal step in my career path in the field of English language instruction. Without a doubt this combination has indeed opened doors for me, such as the opportunity to develop the English language program at a new university in Ecuador. I had been teaching in the Intensive English Program at Arizona State University (ASU) when instructors were asked if they wanted to be part of a small team to go teach in Tena, Ecuador. I expressed interest and I believe was selected to go largely due to my experience as a PCV in Cartagena, Colombia. ASU and the Universidad Regional Amazonica IKIAM have a contract for ASU to assist in setting up the English program at IKIAM. As part of the team here, I’m teaching university level English classes, hiring and training new teachers, and developing curriculum. Prior teaching experience and my graduate courses taught me many of the technical skills I use in this position with ASU and IKIAM, but my PC service gave me the language skills, adaptability, flexibility, and cultural awareness to be successful living and working in Tena. As a PCV I understood the importance of becoming a member of my community, learning from and sharing with others in that community. In the same way, I strive to be an active member of the IKIAM community not only in my role as an English teacher, but also taking part in sports tournaments with students and faculty, assisting teachers in other disciplines, and participating in other activities on and off campus. I’m incredibly grateful for how my MATESOL and PC service have prepared me for and led to what has been a great experience both professionally and personally. I look forward to future doors PC will open for me in the U.S. or abroad! Kaitlin with students at the IKIAM Open House, an event each semester in which students showcase research projects they have been working on. While finishing my teaching degree from the University of Wisconsin-Madison, I was invited to serve in Peace Corps Colombia. Joining the rapidly growing community of other volunteers who bravely ventured off into the world to serve a higher cause, I left with just two suitcases not knowing yet where this bold decision would lead me. My primary project was entitled Teaching English for Livelihoods which took me on an incredible life journey that has impacted me in ways I would have never expected. I learned valuable lessons about teaching and working with diverse constituents, about joining unfamiliar communities, about creating honest relationships, about gaining respect and becoming a leader; but perhaps most surprising was the realization of my own talents and attributes that I had to contribute to the world. It was emphatically encouraging to know that I held something valuable and with that, I could help to improve the lives of those around me. Ultimately I learned that small change makes a big difference, if even in the life of one individual. Peace Corps Colombia, in turn, has changed my life quite differently than I had ever imagined. I now find myself living in beautiful Hawaii where the scenery closely resembles the Caribbean beach town of Santa Marta, Colombia, the place where I was proud to call home for over two years. It’s a wonderful medium for me as I can enjoy the faint resemblances of home in the United States, while still remaining aloof from the culture shock of the mainland. The island has provided me with tranquility and inspiration to continue forging toward my goals. Shortly after arriving to the island, I was invited to work with the University of Hawaii as an ESL instructor. I accredit this opportunity to the Peace Corps which prepared me and gave me the necessary skills to teach students from other countries. In addition, I continued efforts to fundraise for a children’s foundation with whom I worked closely during service. With the help of many donors, I was able to raise nearly $1000 to send back to my community in Santa Marta. Most notably, however, my work in the Peace Corps gave me confidence to capitalize on skills that I hadn’t recognized in the past. 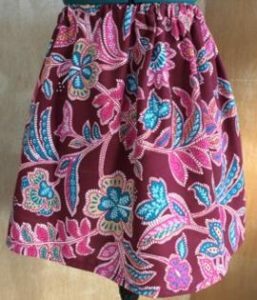 In reflecting on the talents that I now saw as valuable to the world, I decided to start a clothing design business, something I had never imagined doing previously. Although starting a business is an arduous task, I embody the grit and tenacity to continue pushing toward my goals only due to my service in Colombia which provided me with great challenges. From those moments, I found ways to adapt both physically and mentally to strenuous times. For that, I am grateful because I can take those learned skills and now apply them through abstract thinking to find creative solutions to problems when they arise in my business. While moving to Hawaii, working with the University, raising money and starting my business seem like an individual endeavor, I know that it takes an incredible amount of teamwork to make anything successful. Graciously, I have an unwavering community of support from fellow volunteers and those who supported me through my service who are constantly cheering me on. To their accreditation, I am constantly inspired and motivated to continue achieving my goals. Every move, every exchange of communication, every decision I make, is done so out of the experiences I had while serving in the Peace Corps. A few wee ks ago, I boarded a Concord Coach bus in Portland, carrying a black portfolio filled with two years of drawings, photographs and plans to install my first solo show at Pratt Institute in Brooklyn, NY. It seemed almost surreal to hold two years of work in my hands. Thinking about those countless hours spent researching, sketching, drawing, and coloring, while trying to avoid drops of sweat from splattering on the pages, made me realize how they had become such an integral part of my experience in Colombia. At the end of January, when one of my professors from the Art Ed department recommended me for a show in Pratt Institute’s Nancy Ross Project Space, I hurriedly replied, “Yes!” Not only was the timing great and the opportunity incredible, but it was the perfect way to share my experience in Colombia with an American audience. Before arriving in New York, I’d already planned the layout on my computer. With the help of one of my best friends and some work study students, we installed the show in two afternoons. The opening reception was on Thursday, April 7th. To see more photos from this amazing exhibit visit Sarah Shaw's blog at: http://www.mappingwords.com/2016/04/20/in-photos-the-opening-night-of-my-exhibition-in-brooklyn/. The effects of two years living in Barranquilla, Colombia don’t fade easily. That’s what I’m learning almost a year and a half after returning from Peace Corps service and settling into my new life in New York City. The Puerto Rican or Dominican Spanish I hear on the subway floats just as naturally into my ears as el español costeño. The exorbitant prices for tropical fruits in my grocery store don’t stop me from buying a mango every once in awhile. The salsa music roaring from cars on street corners in my East Harlem neighborhood in the summer makes me feel at home. It all transports me back to the loud, hot, vibrant city in Colombia where I was challenged and changed in the best possible ways. As part of the CII-4 cohort serving from 2012-2014, I served as a Teaching English for Livelihoods Volunteer. My primary projects at my school in the gritty downtown area of Barranquilla were co-teaching English classes, leading extracurricular English groups, and other youth development activities. In my free time, I volunteered as a program coordinator for TECHO, an international NGO that mobilizes youth to fight poverty and is well known across Latin America for building transitional houses in extremely impoverished communities. When I first started, the organization’s Barranquilla office was fairly new and poised for growth. I was able to help them develop streamlined processes, organize their records, and become more efficient as they grew to serve more communities and incorporate more volunteers. While I loved working directly with youth in my time in Barranquilla, my behind-the-scenes capacity building and program development work with TECHO was also incredibly gratifying and sparked the successful launch of my career in the nonprofit sector back in the USA. Currently, I work as a program associate at a small nonprofit in the South Bronx that provides pro bono legal and financial services to entrepreneurs in underserved NYC communities. We’re also a small and fairly new non-profit, and so I get to do similar work to streamline our processes and make our work more efficient. I am lucky to use Spanish daily to interpret for and communicate with Spanish-speaking small business owners. I’m now also starting to consider options for graduate school to expand my knowledge and skills for a career dedicated to community development. My time in Colombia led to immense and obvious professional growth, but I think the personal growth is the part that still continues to surprise me. When the Internet goes out at work, I don’t get angry – but others do. When people or cars are loud outside my window, I sleep fine – my roommates don’t. When it’s hot in July, I can survive without air conditioning. When there is a slightly longer wait for a bus or a train, I don’t get anxious. These feel like such small things, but in such a fast paced and high-strung city like New York, my adopted “cógela suave” attitude will help me lead a happier and less stressful life. And for that, among hundreds of other reasons, I will be forever grateful for Peace Corps Colombia. I am writing desde the Caribbean coast of Colombia, where the sun is always bravo and the neighbor's vallenato is never-ending. I'm part of the 10 person Peace Corps Response Volunteer team assigned to the region with the task of establishing the Community Economic Development (CED) sector. We are spread out across the coastal area, operating in four departments: Atlántico, Bolívar, Magdalena, and La Guajira. The first three months of our time in site was dedicated to performing a community diagnostic, in which we were able to better understand the various needs and desires of the communities. The information gathered during this period will be used to set a more standardized view of the region in order to prioritize the focus of the entire CED sector and to aid the future PCVs that will be continuing our work in October. My community is Campo de la Cruz, located at the southern tip of Atlántico. This entire region was devastated by extreme flooding in 2010 and is still working to recuperate the economic activities that sustained their livelihoods. Due to the lack of employment opportunities for the majority of Campo's citizens, and especially the youth, one of the main projects that I will be developing is an entrepreneurship course designed specifically for the community's youth. The course, Construye Tus Sueños, was designed by PCVs in the Dominican Republic and has now been edited and formatted to fit within a Colombian context. The goal of the course is to teach youth how to start their own small business from the ground up. Throughout the 14 sessions, the students learn everything from feasibility studies and SWOT analyses to marketing and accounting. At the end of the course the community and I have planned a business plan competition, during which each student has the opportunity to present their project in a professional setting. After determining which project is the best developed and most feasible, we would like to have the event sponsors invest in the small business so that the project's starting budget is covered. Each year, the course will be taught and a winner will be selected with the ultimate goal being the establishment of a network of small businesses throughout the region that simultaneously contribute to the local economy and decrease youth delinquency. Even though we are just getting started with our work here on the coast, it means the world to us knowing that we have the support of Colombia's RPCV network, and our loved ones back home. Nevertheless, we have quite large shoes to fill in order to live up to this country's legacy of amazing volunteers. With your hard work in mind, we are eager to develop a CED sector that will result in a positive, lasting change for the communities that we currently call home. Less than two weeks ago, I finished my Peace Corps service in a peri-urban fishing community called La Boquilla, located 25 minutes north of Cartagena, Colombia. I’m still thinking about scenes that I need to draw—the lime green cart filled with fritos surrounded by red plastic tables and chairs, the aggressive hat vendors in the Centro, and the bustling, chaotic Bazurto Mercado. Cartagena continues to inspire me. Throughout the last 27 months in Colombia, I documented my experience through a series of full-color llustrations and daily drawings. 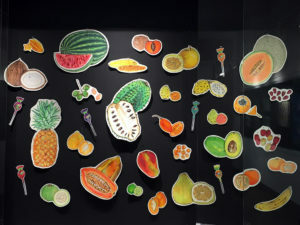 During training, before I knew much about Colombia, I began making collages of scenery from the beaches outside of Barranquilla, typical meals, and street scenes with kids riding bikes and playing soccer. However, on a trip back to the States, I discovered a set of Prismacolor markers that I hadn’t used since high school. The fuchsias, turquoises, and bright yellows reminded me of the colors I saw everyday in Cartagena, and I hadn’t realized the extent of their absence until I was once again surrounded by the calm blues, whites, and muted tones of a New England summer. Back in Cartagena, I began posting my sketches on Facebook and received a very positive response. Colombian friends, Peace Corps Colombia volunteers, my family and friends from the States, co-workers and friends from Korea, and people I’d met from all over the world began commenting and following my posts. This personal endeavor turned into a third goal project, where I suddenly felt motivated to illustrate images that subtly combatted prevailing stereotypes of Colombia being a dangerous, drug-ridden country. 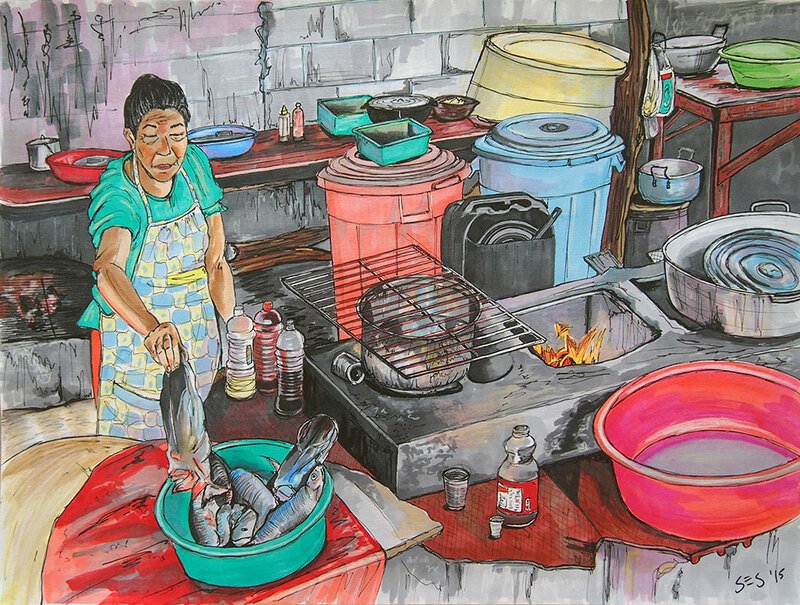 My work showed the daily, monotonous beauty of fishermen working on the beach, a watermelon vendor sending Whatapp messages on her smartphone as she waited for customers outside of a run-down building in a rural town, and indigenous kids playing soccer outside their home in the mountains. 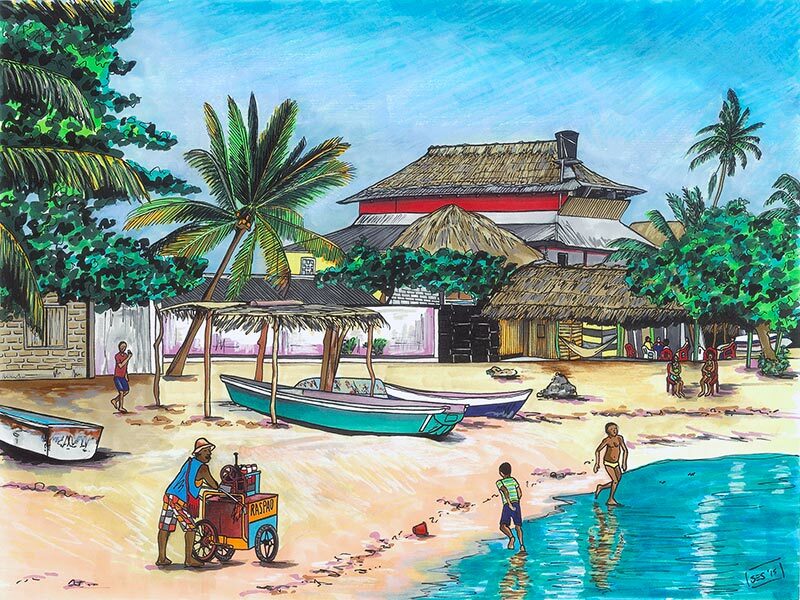 Through art, I was able to show the complicated beauty of my Peace Corps site, a community struggling through cycles of poverty while trapped in the midst of a rich, booming tourism industry. As I constantly observed my surroundings, inspiration struck often, no matter where I was or what time of day. Luckily, my Peace Corps cell phone had a camera function, which allowed me to document daily occurrences. Once I decided on a scene that I wanted to illustrate, I would use photo references to create a composition, often researching other details that I wanted to add into the story—a stray cat or dog, a certain facial expression, or vendors selling various types of street food. After sketching the initial composition, I would outline the drawing with black pens and India ink,and add color with Prismacolor markers and colored pencils. The colored pencils were mostly used for adding highlights. Although I’m now shivering in my over-sized sweater in Maine, rather than sweating through my shirt before noon, the coast is still within me. Songs that I’d hear everyday play in my head as the bright colors continue to evade my sketchbook. I plan to keep illustrating scenes and telling stories from my service in Colombia to eventually combine them into a graphic novel. 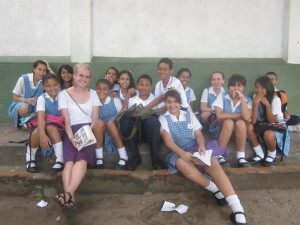 Bio: Sarah Shaw is a recent Colombia RPCV. She served in La Boquilla, a peri-urban community north of Cartagena. She mainly worked on the Teaching English for Livelihoods project in a public secondary school, but also taught computer classes and photography through a youth development curriculum. She has a passion for illustration and visual storytelling, and is continually drawing scenes from her Peace Corps experience, which can be seen on her website, www.saraheshaw.com . She hopes to continue working with communities on art, design and media-related projects. The total trip to Andes from Medellín took about six hours since there were stops at Fredonia, Bretana, Bolombolo, etc. I was beat when we got there. What impressed me most were the steep cobblestone streets and houses supported on stilts—they seemed to be ready to fall into the river at any time. Another Andes characteristic was the tango music that could be heard all over town, especially in the cool nights. Men on horseback, wearing their ruanas, machetes, hats and carrieles or man-purses like the Scots, were common. Their horses would make distinctive sounds when their metal shoes hit the cobblestone surfaces. It was reminiscent of how the Wild West may have been in the U.S. Andes was the largest community where I was assigned, but wait—there I was told I wasn’t there yet! The next morning, Luz Elena Espinal, a mejoradora de hogar working for the Federacion Nacional de Cafeteros, took me to Santa Rita, a corregimiento of Andes. Other than the business-like Luz Elena, I did not have an American or Colombian co-worker. Santa Rita was unique in that it showed no visible means of support or existence. When you got to Santa Rita, it was the end of civilization. There were no more roads, no more villages, no more anything except the uncharted wilderness of the Andes mountains that made a spectacular surrounding. Reportedly, some native Colombian tribes were out there somewhere and beyond the horizon, there were impassable, steamy tropical jungles.